I’ve been so busy with work and family stuff that I feel like I haven’t posted on here since the days of Judah Maccabee. To quell the rioting in the streets over my absence, I will pause from my obligations to wish any readers I have left a Happy First Day of Hanukkah! Or is it Chanukah? The two accepted spellings of this holiday (and I’ve seen about a dozen other variations) are yet another schizophrenic aspect to being a Jew in America. While many Yiddish words have crept into daily usage, another tactic in presenting our practices to the outside world is the Anglify the words we use at home so that outsiders can understand. This is a courtesy that makes sense in certain cases, but sometimes popular culture goes too far, in my opinion. I don’t think a single Yiddish word was used in the movie version of “Fiddler on the Roof” and many of the English translations seemed bizarre to Jewish viewers. Calling a yarmulke a beanie or skullcap or a chuppah a bridal canopy, or even the character called Yenta the Matchmaker which led many viewers to mistakenly believe that the matchmaker’s first name was Yenta. How could they know that the word yenta means matchmaker in Yiddish (no it doesn't, see comments below) so her name in the film was basically “Yenta the Yenta.” Did the producers really think that Gentile viewers would have freaked out if they heard a Yiddish word and not have been able to understand some of them in context? Hanukkah brings its own euphemisms. Want to spot a goy at a Hanukkah party? Look for the guy talking about potato pancakes, candelabras, and spinning tops rather than latkes, menorahs, and dreidels. I’m not criticizing these folks, we had several at our table last night who used these words and they couldn’t have been more charming, respectful guests. In fact, this year the goyim outnumbered the Jews at our house and they slaughtered us in a cut-throat game of dreidel, winning most of the chocolate gelt. I then noticed that the gold foil-wrapped gelt I bought earlier in the day also suffered from an identity crisis. Half of the coins were shekels with Hebrew lettering and the other half were Euros and South African krugerrands. Oy, at least there were no Nazi Reichsmarks with Hitler’s image embossed on the foil! Hanukkah seems much more “popular” today than when I was growing up. I hate the fact that it has come to be a true competitor to the commercialization of Christmas (an accident of the calendar and a marketing ploy of the toy companies), but it has, and the holiday products are no longer relegated to a single dingy shelf at the back of the card store. 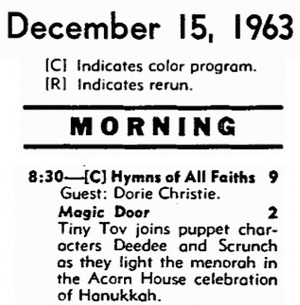 The first time I heard any mention of Hanukkah on television was in 1963 on my favorite Sunday morning program called “The Magic Door.” Produced by the Chicago Board of Rabbis, this wonderful TV show featured a Peter Pan-like elf character named Tiny Tov who lived inside of an acorn house in the city of Torahville. Just say these words and wondrous things you'll see! How I’d love to see this show again. The funny thing is that countless Gentile Chicagoans also loved the show without knowing what they were watching. Many kids, including my Polish Roman Catholic friend Dana, used to watch it “religiously” every Sunday when they got home from church, never realizing that the show was aimed at Jews. Without their parents' knowledge, these kids were being indoctrinated into the ways of the Hebrews for half an hour every week. Getting them right after church? Brilliance! Proof of the plot? Dana ended up marrying our very Jewish friend, Chuckie Cherney. Go, Tiny Tov, another one for our side! No matter the transliterated spelling, the name remains a Hebrew word and neither its initial guttural sound appears in English nor is any English spelling of it ever going to be right... or wrong. That said, I wish you and yours a joyous celebration of all the holiday's meanings, messages, traditions, and spirit. It looks like, between your memory lane travels and at-home bash last night, you are off to a great start! In my neck of the woods it's close to impossible to find a decent menorah. Single dingy shelf at the back of the card store? Where is this card store? I'm going crazy trying to find a particular one! That said, have a Happy Hanukkah! Chag Sameach, Danny! In Israel we used to also say Chag Urim Sameach, which is Happy Festival of Lights. I like that one because of the time of year etc. On the other hand if I was living back in Zimbabwe, December is summer ... just a thought ... although both you and I know that when *I* was living in Zimbabwe, it was called Rhodesia. What's in a name, eh? I am trying to post a comment and I am banned as a possible comment spam. How can I prove my good faith? That's odd, Otir, but since this comment came through, the "ban" must be lifted! Speaking of names, every baby boomer I know still calls the Hanukkah candelabra a menorah but then we learned that a true menorah is really only a seven-candled affair used at other times of the year and that a Hanukkah menorah with eight candles and one shamash is called a "hanukkiah." But I just can't get myself to use that term. if Xmas was a Jewish holiday. Now I am going to circulate the video you showed, I love it too! Oh my God, The Magic Door!!! And just last week, my brother sent me YouTube clips of Diver Dan and Clutch Cargo! I'm regressing...!!! Happy Chanukah/Hanakkuh to you and your family! I don't remember that show. It may have been on when I still lived in Arizona. I'm sorry I missed it. Danny, is that a young Lou Jacobi in the top pic? Was he in the cast of the show? He looks like Lou Jacobi, Pearl, but no, that is one of our very own Chicago Jews! But as you probably know, Jacobi is from Toronto so I wouldn't be surprised to find out I'm related to him since that's where most of my large extended family resides. I wonder what shtetl he's from. Danny, I don't think yenta means matchmaker. I believe it's Yiddish for a pain in the neck. Oops, Miriam, you're right, of course, I stand corrected. "Yenta" means a woman who is meddlesome or gossipy (often the case in a matchmaker, I'm sure!) and has become synonymous with that term thanks to Sholom Aleichem's stories. Sorry for further spreading that misunderstanding--the real word for matchmaker is "shadchan." Deedee and Scrunch must be from before my time. By the time I started watching Tiny was hangin' with Booby Beaver and his grandma Bubby Beaver. 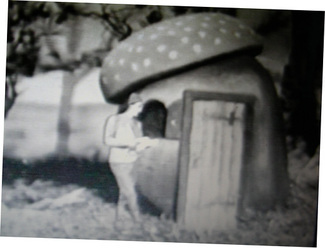 Long before I knew my own address I knew the address of The Magic Door in Chicago and of Zoom in Boston. Thank God I never got lost. WHY can't I find anything about the Magic door? This is killing me! I tried my imagination, but the wonderful things I'd see weren't there! Ahhhhhhh! Tiny Tov is my hero, and I'm Catholic! Every kid in my Catholic school watched the Magic Door. It was a great show! But wasn't the name of the squirrel Bubie (short for "Bubelah"), not "Booby" (as I usually keep abreast of such matters...)? I'm so glad I found something about the magic door . Could there be more to share on Facebook? I found this page when searching for "The Magic Door". A friend posted and short clip on Facebook this morning and I definitely remember watching it. I wanted to see more to refresh my memory. 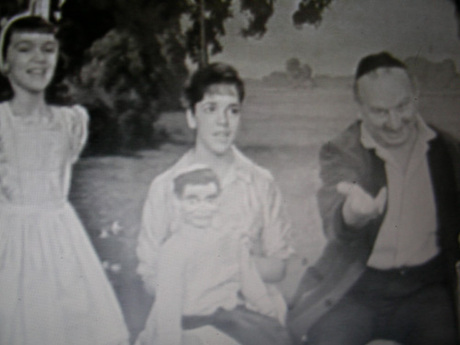 I am not Jewish, but at the time the show was on, our neighbors were Jewish and the kids were my age. I remember being fascinated with Hanukkah/Chanukah, the menorah, and yes the dreidel. My aunt.....Helen Cirkle. She was the puppeteer on The Magic Door. To make a long story short I recently aquired all her puppets. I have Scrunch and Dee Dee. Wanna see? I need help with the names of all her other puppets. I know Rabbi is in there too.